Azaleas / JAKARTA (VIETNAM +) – Since establishing diplomatic relations (12/30/1955) So far, the relationship of friendship and cooperation between Vietnam and Indonesia has made great progress carrying beneficial for both sides. This year the two countries will celebrate 60 years of cooperation way for development. On this occasion, Ambassador Extraordinary and Plenipotentiary of Vietnam to Indonesia Nguyen Xuan Thuy, who has many years of study and work in the country of thousands of islands was for reporters in Jakarta VietnamPlus discussions around this topic. 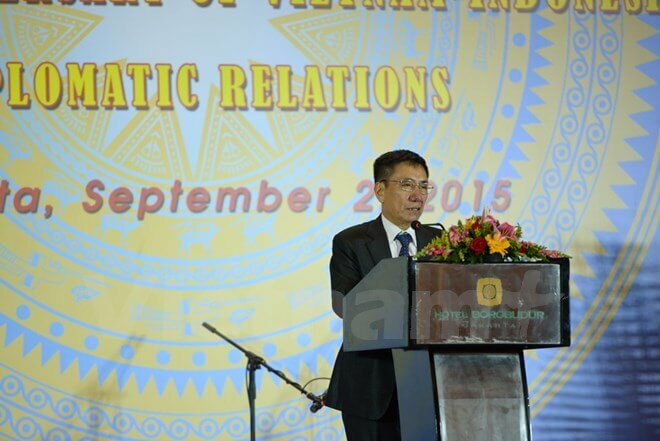 Review the important milestone on the road 60 years of diplomatic relations between Vietnam and Indonesia, Ambassador Nguyen Xuan Thuy stressed there are 3 major milestone of the qualitative change in relations between the two countries. In 1955, the two countries established relations at the Consulate General until 1965 and upgraded to ambassador. In 2003, during the visit of Indonesian President Megawati to Vietnam, the two sides signed the Agreement on Comprehensive Partnership. This is a big change, paving the way for cooperation and development of bilateral relations in various fields. 9/2011 during the visit of Prime Minister Nguyen Tan Dung to Indonesia, the two sides agreed to develop relations towards strategic partners and it has become a reality during the visit of President Truong Tan Sang month 6/2013, leaders of the two countries have officially decided to upgrade bilateral relations to strategic partner. This is the first milestone in quality and turn on all the areas of cooperation. May 10/2013, Minister of Foreign Affairs of the two countries signed an action plan to implement strategic cooperation partner from 2014 to 2018. 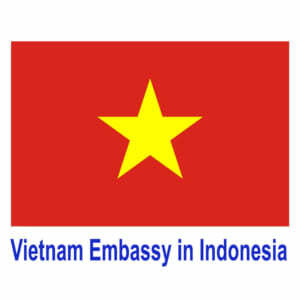 Ambassador Extraordinary and Plenipotentiary of Vietnam to Indonesia Nguyen Xuan Thuy. Ambassador Nguyen Xuan Thuy said that political relations between the two countries’ diplomatic quite closely, with frequent exchange of visits between high-level coordination and cooperation in various fields related to peace nail. According to the Ambassador, Vietnam and Indonesia have more potential for cooperation in many fields, such typical economic cooperation has developed rapidly. In 2006, total bilateral trade reached $ 1.6 billion and the two sides set a goal to reach $ 5 billion this year, but prior to 2014, reached $ 5.4 billion. At the visit of President Truong Tan Sang, the two sides reaffirmed the objective to reach 10 billion US dollars in 2018, this is a major political commitment; and demonstrates the potential of economic cooperation between the two countries. The actual potential for cooperation between the two countries as much as in the economic and trade, investment, Indonesia is also the largest investor among ASEAN investors in Vietnam. Ambassador Nguyen Xuan Thuy stressed the areas of culture, education, tourism as well as the areas of cooperation between the two countries’ potential, particularly since 2012, when Vietnam Airlines opens direct flights City Ho Chi Minh-Jakarta, exchange of tourists between the two countries has increased dramatically. Every year around 80,000 visitors and 50,000 visits to Vietnam Indonesian tourists visited Indonesia, Vietnam, opened up a field of fruitful cooperation between the two countries; opportunities while enhancing people’s exchanges and contribute to more active participation in the ASEAN Community. On the challenges of economic cooperation between the two countries in the near future, Ambassador Nguyen Xuan Thuy said the formation of the ASEAN Community in December this year, in conjunction with the ASEAN Economic Community is noteworthy birth toothpick. Since the formation of the community, in addition to the cooperation, the member states must also be ready to participate in the competition, because many ASEAN members are developing economies. Also competing for the quality of goods, Vietnam and Indonessia well as other member states also have to compete on price, at the same time preparing forces to participate in the community, especially the business community. Mechanisms and Vietnam and Indonesia have 2 mechanisms include Joint Commission on Science and Technology, by the Minister for Trade Commission chairman and bilateral cooperation by the two Foreign Ministers master President. These are support mechanisms to promote effective cooperation between the two countries. Ambassador also mentioned other aspects of cooperation between the two sides as defense cooperation, exchange of delegations of armed forces (navy, air force, army …). On balance the bilateral relations to promote joint cooperation in ASEAN, Ambassador Nguyen Xuan Thuy confirmed development look back at the history of ASEAN, could see Indonesia and Vietnam are two very active members in all areas contribute to the development of the Association. In the new stage of development when ASEAN Community formed will pose problems balancing national interests and regional interests, members will need to consider in order to harmonize the benefits. This issue, the two leaders also had calculated, the two sides plan to participate in all fields with the role of promoting the development of the community, but at the same time bring benefits to each member , including Vietnam and Indonesia. Indonesia is a big country, big market in the area of ​​Maritime Southeast Asia countries, while Vietnam is a large country, the economy is dynamic, fast-growing Southeast Asian region in the continent. The two economies are closely cooperating to form a solid backbone for the ASEAN Economic Community in the new stage of development.